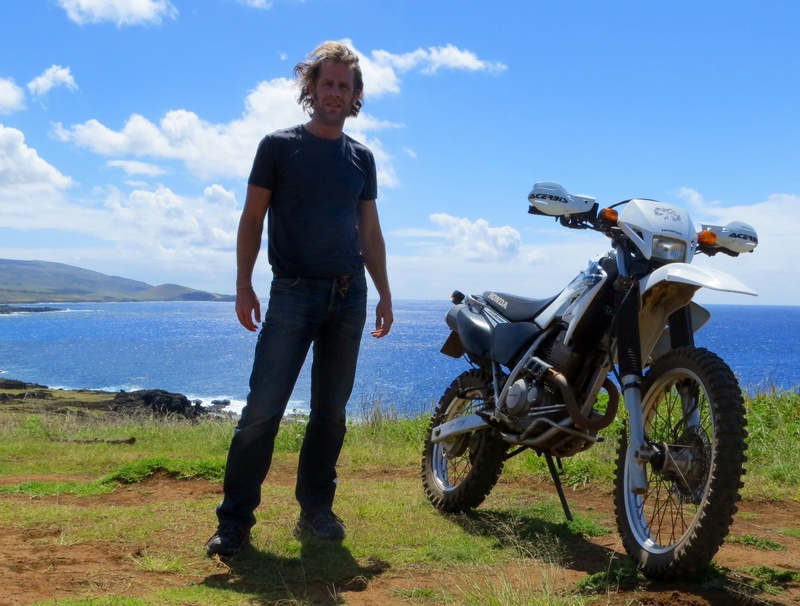 On Rapa Nui, you won’t find wealthy businessmen cruising on their brand new BMW 1200s. Here, the motoquero is a very different breed to those in Santiago. 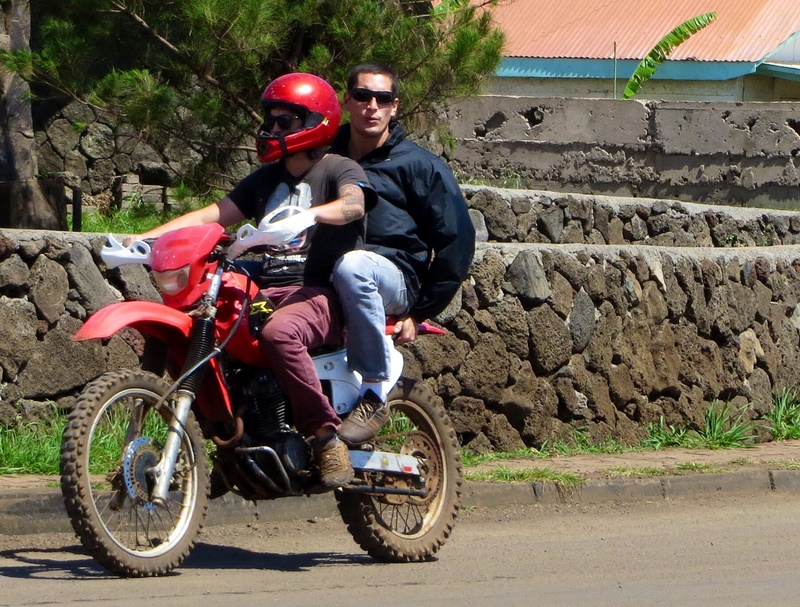 The undisputed champion of the roads of Rapa Nui is the 250cc dirt bike. There are hundreds of them. A few look like they have just been unloaded from the freighter which is currently moored off shore, but most have been beating the dirt roads of this island for a long, long time. And it’s not surprising really; bikes on the Chilean mainland are expensive enough, but with everything in Rapa Nui arriving by either land or sea, I dread to think how much a new moto would cost here. A 1.5 litre bottle of mineral water here is over twice the price as it is in Santiago. Granted, the scales of economy for bottled water and motorbikes probably differ, but you get the point. Rapa Nui is of course part of Chile, but the rules of the road clearly haven’t been exported from the mainland. Far from it, in fact. Helmets are optional and most take advantage of this, riding with the wind in their hair. Headlights at night certainly appear to be optional, given the number of stealth riders I have seen after dusk. And the carriage of bulky items on a moto seems perfectly acceptable; yesterday I saw a rider go by sitting on his surf board. As if to reinforce their independence and freedom from the traffic regulations of the mainland, the pulling of wheelies along the waterfront is a popular past time – usually by a rider in shorts and flip-flops. I’ve seen at least one bike, and usually more, every day drive past with his front wheel aimed skywards. So this morning I decided to join the show, and hired myself a Honda Tornado – the trusty steed of many throughout South America, being made under licence in Brazil. I went against the grain and opted for a helmet and also a pair of long trousers, however my bike was very much from the stable of the Rapa Nui motoquero – no speedo, no wing mirrors, only half a break lever, a spark plug that seemed rusted in place, indicators that seemed eager to detach themselves from the bike… But she was shod with chunky off-road tires and when I got her going, she proved to be a beauty. I did a full lap of the island, seeking out every small track and trial I could find. And keeping to the age-old tradition of driving hire vehicles, I gave her a good thrashing. I loved it. Most people drive around the island to see the totally unique and other-worldly stone carvings of giant heads, for which the island is world famous. I must confess that I only gave them a few minutes of my time. 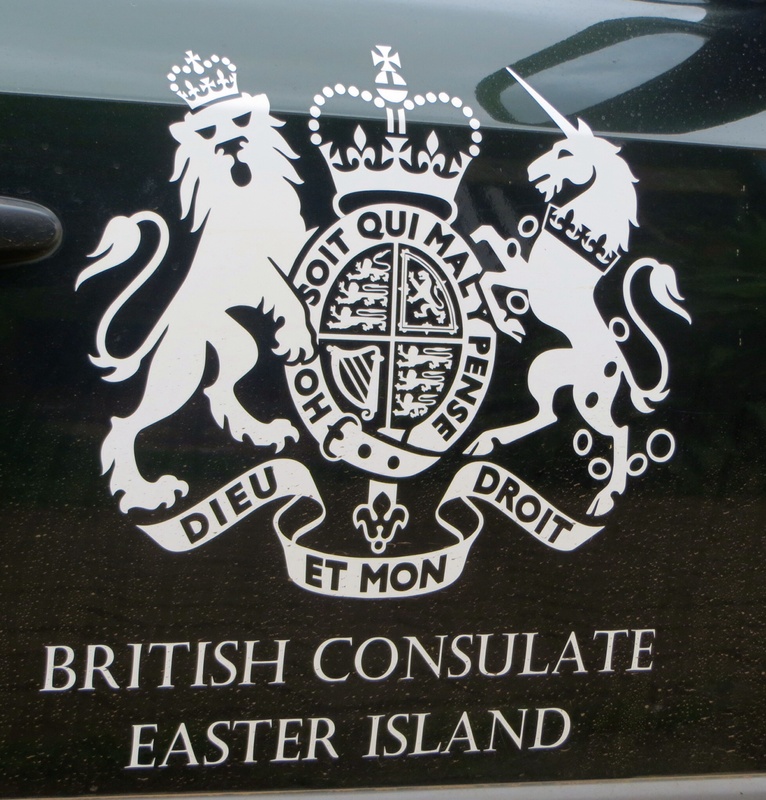 Before I set off, whilst having lunch at my favourite empanada restaurant, I was surprised to see a small four-wheel drive vehicle pulling up outside bearing the royal crest – it was the staff car of the British Consulate, no less. Amazed that we had a consulate here, I ask the chap who was driving it why he was here. It turned out that he is only an honorary consul and a one-man band; he runs tours around the island as his day job. As we chatted, he explained that what occupied him most regularly was helping UK nationals in hospital, and perhaps if they have any trouble with the Caribineros. So as I mounted the Tornado and headed out of town, I felt reassured that I’d be well looked after if I either crashed or was pulled over for speeding. Whilst I may have parked the bike up this evening with a broad smile on my face, I go to bed with a problem. For the last ten months or so I have been riding a 660cc moto which weighs in at about 220kg before I put my luggage on it – which adds another 25kg. I’ve have ridden it down gravel roads, dirt tracks, forest trails and along mountain passes, dropping it numerous times and nearly breaking my back every time I picked it up. Today I was riding a bike about 80kg lighter, and I had a moto-epiphany. Amongst the several schools of thought about adventure motorcycling out there, one preaches “light is right”. I now see why. I love my Tenere; but she is a front row forward whereas a nimble little 250 is a scrum half. Will I ever be able to enjoy riding off-road again with the Tenere, knowing what I could be doing if I had a number 9 on my back?